Boneyard Pets are oversized, 3D dinosaur models that are Made in the USA. Sturdy, visually compelling, and fun to build, they can be displayed in your home, office, or yard. Dimensions (assembled): T-Rex: 22" x 28"; Spinosaurus: 18" x 32"; Pterodactyl: 29" x 15"; Styracosaurus: 14" x 26"
A Boneyard Pet is like a stylized, at-home version of a museum exhibit. 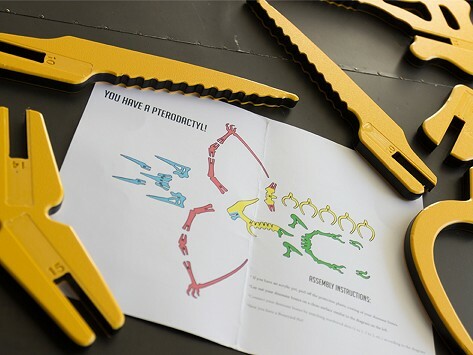 These brightly colored, 3D dinosaur models are fun for anyone to put together. Sturdy and dense, they’re made to last as pieces of art in a child’s room or home office. The concept for these creative creatures began with Founder Eric Winston. He loved the tiny, balsa wood dinosaur puzzles he played with as a child, but they always broke fast. He challenged his Brooklyn design studio to invent a new version to put those throwaway puzzles to shame. After some rigorous trial and error, Boneyard Pets were born. These eye-catching, intricate dinos are as fun to build as they are to behold. Each pet is Computer Numerical Control cut in Brooklyn out of 100% American recyclable materials. Available in different breeds, sizes and color combinations, Boneyard Pets can be built as a family project with little kids or as solo project for older ones. The construction gives you a sense of accomplishment, and the finished piece brings a big-boned dose of drama to your surroundings.